Lorri's finished Sirdar Coat...which is really a super chunky cardigan..YEAH LORRI! * Sisters of Knit Sibs podcast are each contributing a prize! * She-Knits for Knitters (yes ths is me, Sharon) is contributing one of her wonderful KITS from her etsy shop (winner's choice). 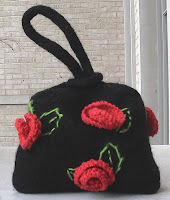 The 5 Petals Bag Complete Kit or The Sunflower Bag Kit. Hey, Sharon! I wrote you one time last summer about your children, but I must have posted on the My Podcast site. Anyway, I've been meaning to tell you just how much I've been enjoying the show and really - it's so great that you are consistent! I love that there's a new show every week. I know that it may not always be the case - situations and lives always change - but I know that it amounts to a good deal of work (sheesh, just posting on my blog takes at least an hour usually, with all the photos and links!) and I just wanted to let you know I appreciate it! I love your podcast. I listen while I knit on the train going to work. You mentioned Vickie Howell's podcast a while ago and I went to itunes to subscribe. Okay she interviewed the wife of a member of Green Day. Yes that was cool. But this week she interviewed an actor from Saturday night live. It was the first day of the writers strike and she said to him that being on strike must be like being on vacation. Fortunately he told her that he had to walk the picket line and would not be getting paid so it was not like a vacation. I was shocked that she seemed so out of touch. For me it was a complete turn off. I would rather listen to one of the many harry potter crazy sock knitters. Please do not ever give up your podcast. Your style is relaxing and i look forward to you podcasts.